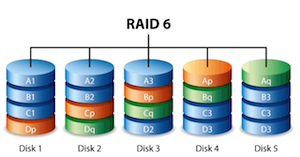 There are two distinct types of RAID 6 architecture: RAID6 P+Q and RAID6 DP. DP, or Double Parity raid uses a mathematical method to generate two independent parity bits for each block of data, and several mathematical methods are used. P+Q generates a horizontal P parity block, then combines those disks into a second vertical RAID stripe and generates a Q parity, hence P+Q. One way to visualise this is to picture three standard four disk RAID5 arrays then take a fourth array and stripe again to construct a second set of raid arrays that consist of one disk from each of the first three arrays, plus a fourth disk from the fourth array. The consequence is that those sixteen disks will only contain nine disks worth of data. P+Q architectures tend to perform better than DP architectures and are more flexible in the number of disks that can be in each RAID array. DP architectures usually insist that the number of disks is prime, something like 4+1, 6+1 or 10+1. This can be a problem as the physical disks usually come in units of eight, and so do not easily fit a prime number scheme. RAID 6, although far less frequently used than RAID 5, accounts for a significant number of server setups. RAID 6 systems that we’ve recovered data from include Dell PowerEdge / PowerVault, HP Proliant, XServe and SuperMicro systems. In addition to a free collection service that ships your damaged RAID to us, we offer a UK call out service where we repair your RAID & recover your critical data onsite. With 15 year’s worth of RAID expertise, we know a thing or two about RAID 6 recoveries. In fact, two of the most high profile recoveries we’ve done to date were RAID 6 systems: one was for the Williams F1 team over a Grand Prix weekend, and the other we can’t talk about due to non-disclosure. Our RAID Team operate countrywide and we can provide either onsite or offsite emergency services if required. Call us now on 0871 977 2525 or use the contact form to your right and we’ll call you.